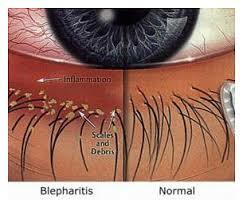 Blepharitis is an inflammation of the eyelid margins adjacent to your eyelashes. It is characterized by redness, irritation, and debris associated with this section of your eye. Causes of blepharitis include acute bacterial infection of the eyelids and associated glands, chronic infection of this area, or a localized form of seborrhea. Blepharitis may be associated with various systemic and dermatological conditions such as Rosacea and generalized Seborrhea. These conditions tend to be chronic and require ongoing treatment. We’ll make the specific diagnosis and prescribe the most appropriate treatment for your case of blepharitis. A relatively recent advancement in the treatment of blepharitis has been discovered with the use of Azasite, a macrolide topical antibiotic that has significant anti-inflammatory effects. 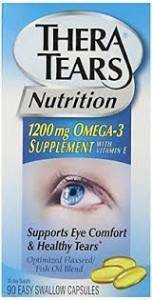 Other helpful additions to the treatment of blepharitis include the use of other topical anti-inflammatory agents such as Restasis(cyclosporine) topically and oral nutritional supplements containing Omega-3 such as TheraTears Omega-3 (also providing anti-inflammatory effects). Note that the use of these agents for the management of blepharitis is currently considered an “off lablel” use and should only be initiated following examination and consultation with your doctor at Broward Eye Care. Warm Compress: Soak a clean wash cloth in hot water. Ring the cloth out so excess water is removed. Apply the cloth over the closed eye for approximately two minutes or until the cloth significantly looses heat. 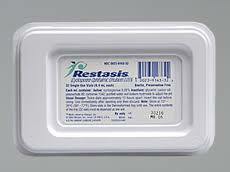 A preferred method utilizes a “Eye-Essentials” that is warmed in a microwave for about 20 seconds. The mask is placed over both eyes for about 5 minutes providing even heating and extended duration of treatment. Many of our patients report that this is a “spa-like” treatment and feel much better after use of the hwarm washcloth. The masks are available at the Broward Eye Care. Lid “Scrub”: Use either pre-medicated eye lid cleansing pads (such as OcuSoft eyelind cleanser) as suggested by your doctor or use a clean wash cloth wrapped around your index finger and dipped in a solution of 50% warm water and 50% baby shampoo. Rub the eyelid margins, close to the area where the lashes enter the lid, in a back and forth motion for approximately 20 seconds. 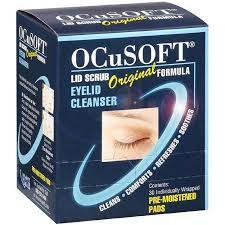 Perform the scrub first to the lower eyelid and then to the upper eyelid of the effected eye(s). Following the lid scrub rinse the lids with warm water to remove any residual debris. 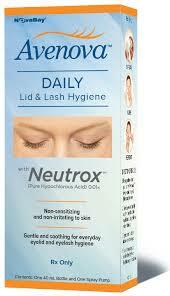 A new a more effective lid hygiene method utilizes Avenova daily eyelid and lash treatment by NovaBay pharmaceuticals. Avenova incorporates Neutrox hypochlorous which acts not only as a cleansing agent, but also is a potent anti-microbial that is effective against the most common bacteria associated with blepharitis. Avenova solution is available at the Broward Eye Care.